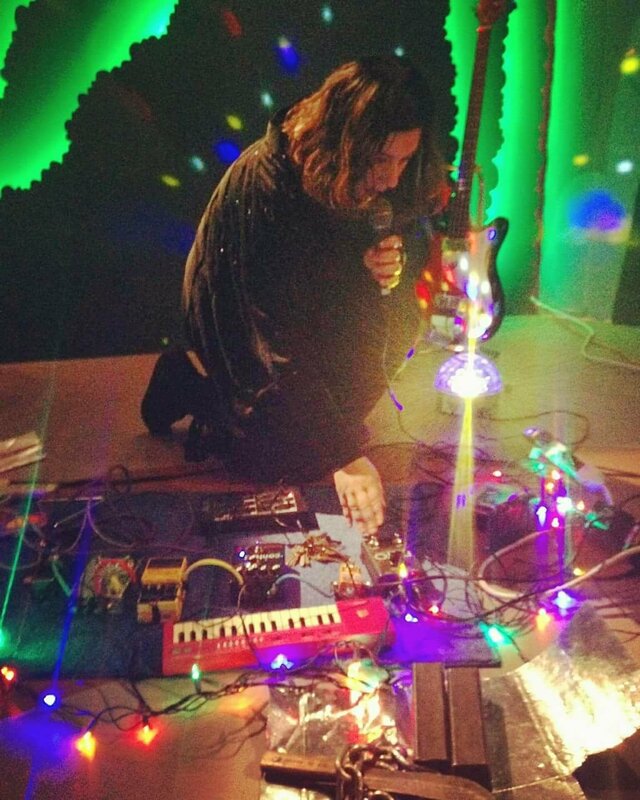 Spookstina: My performance centralizes around creating and decaying sounds and textures. It’s an improvised performance, and with the exception of a cassette tape here and there (generally of nature sounds or lectures), all sound is created in real-time. I don’t use samples or anything pre-programmed; I prefer to build everything live piece by piece, and then manipulate and destroy what I’ve created. The main tools I’m using in my current setup are a Moog Werkstatt synth, a contact mic (thanks, Crank Sturgeon), a vocal mic, a bass (usually my Epiphone Newport), instrumental and vocal loopers, a line of pedals which changes from set to set (my favorite mainstays would probably be Red Panda’s Context and Fuzzrocious’ M.O.T.H. ), one or more cassette players, a variety of toy instruments and a bunch of extraneous pieces of scrap metal (chains, screwdrivers, rebar, etc.). Depending on the length of time I have to perform, and the audience and environment of the show, my instrumentation expands and contracts– generally for a noise fest, my sets are more performance-based and brutal given the short length of performance time, whereas for a two-hour improv set (thanks to Ruby Deluxe in Raleigh for affording experimental artists with this opportunity), things have a longer ebb and flow, and are more of a sonic journey than an assault on the senses. FLON: Well, I like both of those approaches. Experimental Night at Ruby is a wonderful thing. You’ve gigged a lot this past year. How has your experience been? What are some highlights, cool people you shared bills with and, especially, tell me about Mexico. Spookstina: This has been a pretty intense year for me. In the course of the last three months alone, I’ve played numerous shows in North Carolina (where I’m based) and have played shows and fests in DC, Baltimore, Harrisburg & Pottstown (PA), Chattanooga, a two week tour of Mexico (with shows in Guadalajara, Mexico City and San Miguel de Allende) and I have a couple of more fests coming up in Santa Cruz, CA and Atlanta. I’ve opened for some fantastic acts, like Kayo Dot, Anklepants, Katie Alice Greer (from Priests), and have shared bills with some of my favorites from NC, like Clang Quartet, Joules and Bitter, Inc.
As far as US shows go, my favorite fest so far this year was playing Jerry Reed’s (final) LEAKY SOCKETS 2017 in Chattanooga. I’m still not sure how he made it happen, but Jerry was able to book the fest inside of Wayne-O-Rama; an art installation created by Wayne White (artist, puppeteer, set designer best known for his surrealistic pieces and work on Pee-wee’s Playhouse, the Smashing Pumpkins’ “Tonight, Tonight” video, and a whole host of other incredible things). It was a dream to perform inside this world created by Wayne; a space filled with gigantic glittery-eyed puppets, tinsel waterfalls and homage to Chattanooga’s history. Away from home, the fest I played in Mexico (México Y2K17 Loopfest), was truly an experience. I met the festival’s organizers, Eliud and Lizeth (of the Guadalajaran band, CIAN), last fall when we played a fest together in Texas. Both fests in Texas and in Mexico were “loopfests;” dedicated to artists using live looping during performance. Unlike the DIY and noise fests I generally play, these fests are made up of artists of all genres, with the one commonality being a use of looper pedals during performance. In Mexico, the festival was two weeks long, and I performed in Guadalajara, Mexico City and San Miguel de Allende with artists from Mexico, the US, Germany and France. Performing in Mexico was a special experience; the weight of the arts is extremely valued and ingrained in Mexican culture, and it weaves a beauty through their country that sometimes feels amiss in the US. During this fest, the set that left the most impact on me was performing inside of Mexico City’s Metro Mixcoac subway station. I was set up adjacent to the platform, but inside of the glass walls of Museo del Metro (a tiny and wonderful museum dedicated to the Metro’s history and impact on MX). From the museum staff’s count, over 400 people came inside to watch my performance, and many more were standing outside with their faces pressed up to the glass. To think that you might leave a tiny impact on a stranger making their rush hour commute home is one of the beautiful things about creating and sharing art. FLON: That sounds amazing! I’ve been saying for a while that a lot of really good music is going to be coming to the US from Mexico in the next few years. Hopefully you can bring some bands you’ve met to the US for shows. So, that’s a super busy year. I noticed that you started the year off wth a live performance on Little Raleigh Radio‘s Esoterica, and released it as an album on Bandcamp. Do you have plans to make a studio recording or release another live performance? Spookstina: I’m planning to work on a studio recording over the winter when things quiet down for me. With being on the road and working so much, it’s been difficult to get into the headspace and solitude that I need in order to explore the depths of what I’m creating. Much of the last year has been flying by the seat of my pants from one show to the next. It’s been a fantastic way to gain more bearings on my gear and the techniques that work for me, but I’d like to combine all of that with the ideas that have been incubating inside of my mind. FLON: Can’t wait to hear what you do in the studio. Keep me posted and I’ll feature the release in a future article. Posted in avant-garde, electrocoustic, electronic, experimental, improvisation, interview, multimedia, noise.Tagged avant-garde, electrocoustic, experimental, improvisation, noise music. Next Post Interview with Patrick Neill Gundran, aka Uneasy Chairs.